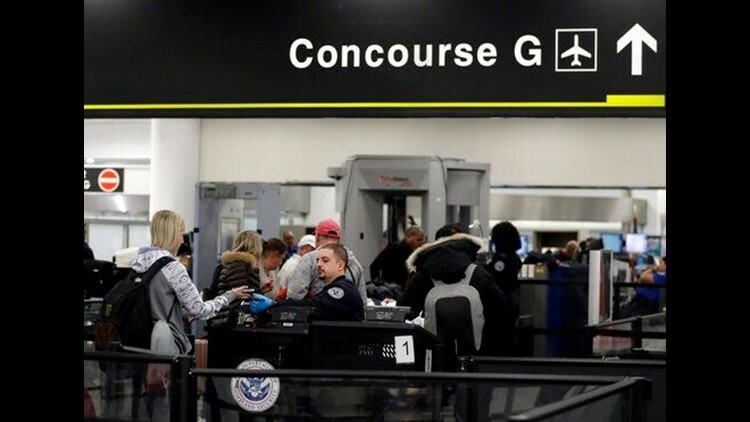 AP - The partial government shutdown is starting to strain the national aviation system, with unpaid security screeners staying home, air-traffic controllers suing the government and safety inspectors off the job. Here is a roundup of recent developments in the partial government shutdown's impact on air travel. Screeners represent just 6 percent of government workers who didn't get paychecks Friday because of the shutdown. Airline-industry officials worry that they are particularly likely to stop showing up because their relatively low pay means they could quickly struggle to pay bills without money coming in. "TSA only has what it has," said Christopher Bidwell, the vice president for security at the trade group Airports Council International-North America, "and although they have advised us that they are continuing to hire and train, we are very concerned about a prolonged government shutdown." Miami International, the nation's 25th-busiest airport, plans to close off Concourse G at 1 p.m. for the next three days and shift a dozen flights a day to other terminals. "Our wait times have been normal and operations have been smooth so far, but the partial closure is being done in an abundance of caution," airport spokesman Greg Chin said Friday. "Our inspectors are the oversight, they are the regulatory side of the house for the FAA," said Mike Perrone, president of the Professional Aviation Safety Specialists union. Their work is not getting done, he said. An FAA spokesman said earlier this week that the agency is recalling inspectors and focusing resources on overseeing airline operations. He declined to say how many inspectors are working, but union officials believe it's about 100. "A hundred out of 3,300 is probably not real good odds," said Stephen Carl, an FAA inspector in Florida. "Please put us back on the job right now. Aviation is not being overseen." "As the lines slow down and the crowds grow larger, it puts more and more passengers at risk from an attack," Price said. He added, "The screeners who do come to work will be forced to make up the slack, which erodes their effectiveness even more." TSA officials said despite fewer numbers, screeners aren't getting lax about their work. "Security standards have NOT and will NOT be compromised," tweeted TSA spokesman Michael Bilello. In 2016 — when TSA was understaffed at many airports, creating lines long enough to make many travelers miss their flights — other airports explored hiring contractors. Most dropped the idea after TSA's performance improved.